The shown generated file state indicates if a file was generated and saved successfully or not. 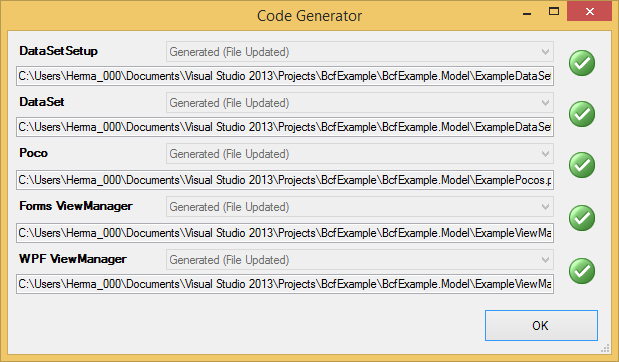 The option to generate the code file is not set (see Project). Code file was not created. Code file was created and saved. Code file was created and saved. A file with same name was updated. Code file was created but not saved because content is unchanged. Code file was created but saving has thrown an exception. Move mouse over the error icon to see the exception. Exception while generating code. Move mouse over the error icon to see the exception.